This outfit got such an unexpected (to me) reaction on social media that it prompted me to blog about it. About how outside my comfort zone it pushed me and about how nervous I was to share it online. I'm not a fashionista....far from it. And I have that mutton/lamb debate constantly running in my head. What looks amazing on Alex from The Frugality could so easily look tragic on me - 10+ years older! So I do admit to playing it safe - admiring catwalk trends but rarely buying into them. But then I was in Sarah Jane boutique a few weeks ago and Patricia who works there made me try on the skirt in the photo above. She promised me it would be amazing and on the day I kind of got where she was coming from but I was still unsure as to when I would get the chance to wear it. But I took the risk and bought it, along with the boots - both in the sale. A work trip to visit the buying team in Arnotts in Dublin suddenly presented the perfect opportunity. Knowing it was a 'fashion-ey' kind of meeting in the big smoke (and not the school run) made me brave. And then all you lovely people who follow me on social media just blew me away with your comments and encouragement. So much so that it got me thinking about being brave a bit more often. I am guilty of avoiding edgier trends because at the end of the day (and the beginning too), I have a school run to do. 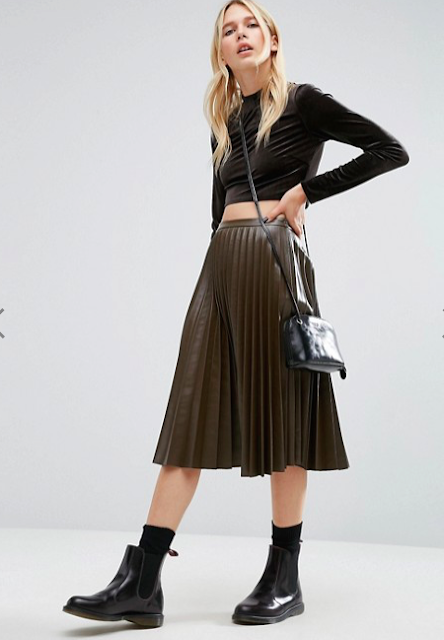 One where faux leather skirts and ruffles would definitely attract attention. But this year, instead of wearing the same shapes/silhouettes again and again, I am going to try to move outside that comfort zone a little more often. For instance, I have a leopard print pleated skirt from M&S that I got in the sale a few weeks ago. I saw tons of bloggers totally rock this skirt over the past few months, yet I've not been brave enough to wear up to now but I promise I will wear it before February is over. Meanwhile, thank you to all of you who reacted to the photo and encouraged me in my scary moment! For all who requested (and there were LOTS! 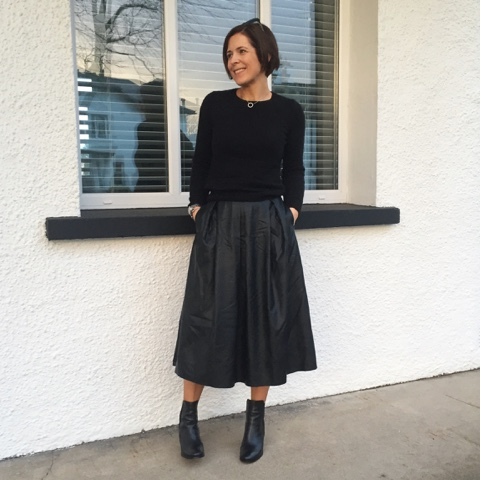 ), here are a few other faux leather full skirts online if you would like to replicate the look. This next one is black and in the sale though a little different to mine as it's longer at the back. Available in small sizes only now as it's in the sale. PS my skirt was in the sale in Sarah Jane and I bought the last one in a size 10. The brand is a French one called Sineqanone and I've linked to their website there but I've searched and the skirt isn't showing. It's a neat fit - I can just about get away with the 10. My jumper is a cashmere crew neck from John Lewis. Has been the jumper of my AW16 - amazing. It even survived an accidental tumble drier session. It shrunk a tiny bit but that only made it even more perfect to wear with this skirt. My boots are also from Sarah Jane - they are Ilse Jacobsen and were in the sale. They're a great length and heel height and I wore them every day last week. I'm wearing a similar shape but shorter skirt today. It's on my IG. Anyway my family hate me in mine but work colleagues love it. I've had so many comments. ...men too. I rebel against my family who try to maintain my comfort zone for me. Yes you are rocking that skirt. It's fab on you. Good on you trying it out. I hope you are reassured by your colleagues too. Love this outfit :) I often think I can't get away with shapes like this, but might just give it a try! Lovely skirt /look- glad the Dublin trip provided the opportunity lol!! You look amazing in that outfit! And I love the boots. I tried to look online for them but the only Ilse Jacobsen boots I can see are welly-type affairs!